Using Twin-jet exhausts to reduce take-off distance is one problem being studied at the Lewis Flight Propulsion Laboratory. In this historical photo from the U.S. space agency, researchers study the effect of twin-jet exhausts inclined toward the ground in a simulation of take-off conditions for certain engine installations on July 7, 1944. Such an engine installation is useful for decreasing the takeoff distance of aircraft. 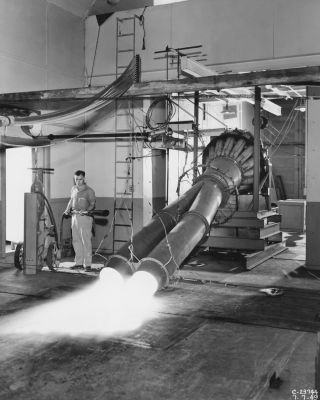 This is one of many problems of operation that were under study at the Lewis Flight Propulsion Laboratory, of the National Advisory Committee for Aeronautics, now known as John H. Glenn Research Center at Lewis Field, Cleveland, Ohio.